Truth Is Strange And Fiction Is Charming In 'Girl Waits With Gun' Amy Stewart's new novel is inspired by the real-life tale of the Kopp sisters, three women who faced down a cruel factory owner after he crashed into their buggy and refused to pay restitution. It might seem odd to be reading about an old-fashioned farmstead shootout and thinking about how charming it is, but if you're reading Girl Waits With Gun, you might as well get used to it. You'll be thinking that a lot, because the women holding down this particular farmstead are Constance, Norma, and Fleurette Kopp, who handle the battle with grim panache. Though they're under fire, Constance's narrative voice is endlessly pragmatic and authoritative: Neither stray internal monologue nor enemy bullets will be permitted. Author Amy Stewart has built her literary career on personable nonfiction that blends intensive research with a deceptively breezy style. Most famously, she's the author of The Drunken Botanist, a history of plants as used in tipple. However, she also wrote 2005's The Earth Moved, the most impassioned treatise on earthworms you're likely to read this year (or, really, any year). That sense of the drive beneath the facts underscores every page of Girl Waits With Gun — a story drawn from the real-life Kopp sisters, who in 1914 found themselves in the headlines after factory owner Henry Kaufman crashed his car into their buggy. When they demanded restitution, he began a campaign of harassment and intimidation, thinking to scare them into compliance. Instead, the sisters (led by Constance) took the fight to the streets, involving law enforcement and the press in an attempt to get Kaufman behind bars. It's a historical setting almost disheartening in its timeliness. Kaufman's bullying tactics (verified by court records down to the last threatening letter, because sometimes you can't make this stuff up) are all too familiar to many of today's women who have asserted themselves in public. And the Kopp sisters, who farm the family homestead by themselves, already operate under pressure from their brother Francis to settle nearby in town and diminish quietly, as is expected of them. It's one of this novel's many sly, unspoken jokes that Francis has so underestimated his sisters: They're often a mess — Norma has a pointless obsession with pigeons, Fleurette has a flair for the dramatic, and among the three of them there's not quite enough agricultural concentration to keep a profitable farm. But they're a mess on their own terms, and Francis' demands hit close to the heart of Girl Waits With Gun -- at some point there's not much difference between a drunken bully and your own brother, if they both want you to sit down and be quiet. You'll have to fight it all. 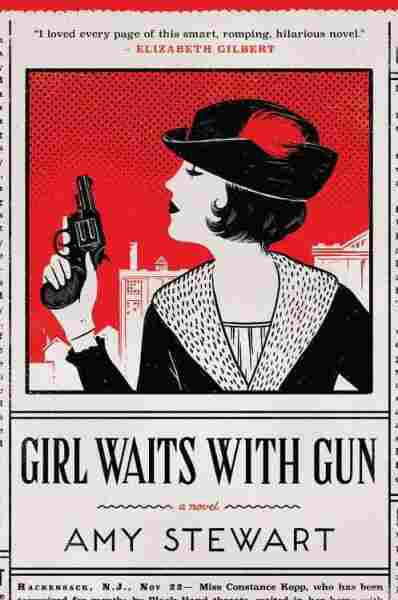 'Girl Waits With Gun' might sometimes be a story in which truth is stranger than fiction, but it also makes for pretty charming fiction. And while the layering of history and narrative creates moments of meta-mystery within the novel, the heart of the matter lies in that farmhouse. Stewart gives us three sisters whose bond — scratchy and well-worn but stronger for it, as can happen with family ties — is unspoken but effortless. Girl Waits With Gun might sometimes be a story in which truth is stranger than fiction, but it also makes for pretty charming fiction. Genevieve Valentine's latest novel is Persona.